Why I have a tablesaw. September 29, 2015 8:05 pm / 9 Comments on Why I have a tablesaw. I haven’t made a piece of furniture in many months. I’m not too happy about that fact. This has been my longest stretch without making a piece of furniture since I started woodworking. But I found that my hiatus did have one added benefit; it gave me time to think. In actuality my upcoming project has been in the planning stages for several months though I only decided on starting it a few weeks ago. But it has given me more time than ever to plan every joint, the assembly order, and all of the little details that are sometimes missed, not only in my head, but on paper. But the real “rarity” was my laying out every tool that I plan on using for each phase of the construction. I can’t recall ever doing that before. Of course, like most woodworkers there are certain things I do during a project that happen “on the fly”. I’m sure that this project will have some of those moments, but I think they will be few. When I said “layout the tools for the project” I meant in my mind’s eye. But all of these planes will see use. Friday afternoon I got to do something that I don’t often get to do: Go to my local lumberyard. For the record, this lumberyard is not a hard wood dealer. Though they offer some oak, maple, and cherry, most of their business is geared towards construction. What they do offer is very nice, clear pine, and that is what I purchased. The only mistake I made was not purchasing enough, and that only because it wouldn’t fit in my car. But I got enough for the bulk of the construction, which cost me $78.00. While I would have loved to build this project from oak, I chose pine because it was in my budget. $78.00 gave me both case sides, all 5 shelves, and the top and bottom trim pieces. The only thing I am missing is the 3 boards needed for the back. Though I’m happy to have visited the lumberyard this past weekend, the real reason I am writing this post concerns my table saw. 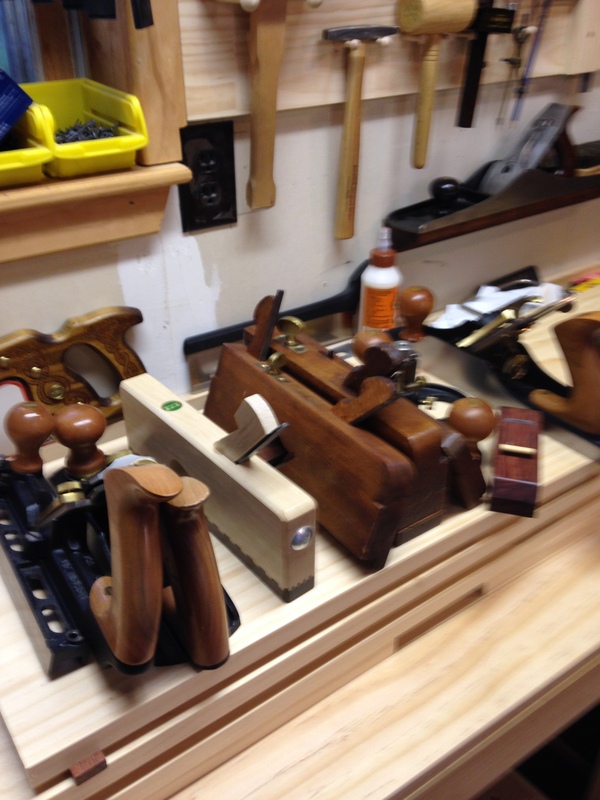 Anybody who reads this blog on a somewhat regular basis knows that like nearly every other woodworking blogger on the internet, when concerning woodworking, I often use hand tools. I’m not a zealot; I’ve said many times over that I don’t care who uses what. And I’m happy to say that it’s been a while since I’ve come across the “Hand tool vs Power tool” forums. While I don’t see the spiritual side to using hand tools that some woodworkers claim to find, I do enjoy using them. However, on Saturday morning I prepped all of the stock for this project, first rough cutting it to size and then sawing it to finished length and width. I did nearly all of that prep work using my table saw. So the woodworking mafia has effectively shut down my vitriol with thinly veiled accusations and threats of blackballing. My wife, who hates me, couldn’t really care less if I look like Captain America or Captain Crunch. And, I spend more than half of my waking hours at work. Life has not been kind to the SCW lately. But when the going gets tough, the tough get going. I can still woodwork, and that is exactly what I am going to do. This past summer was pretty rough, and I’m not only talking about the weather, and for a while it didn’t seem like woodworking would be in the cards for the foreseeable future. But just as I was lamenting my lack of inspiration concerning possible woodworking projects, several ideas came to me at once. So for my next project I am going to make a narrow bookcase/display cabinet. I’ve always liked the look of Arts and Crafts style bookcases; I like narrow cabinets, and maybe most importantly, I have the perfect place for it. , So I researched a few common designs, combined the features that I liked, and began making some drawings and laying out basic dimensions of the case. I don’t actually plan on using the cabinet for books. A hobby of mine, which may sound strange to some people (which also drives my wife crazy), is framing and displaying historical letters and documents, such as the Gettysburg Address, the “Infamy speech”, as well as documents such as Declaration of Independence. Though I’m partial to material pertaining to George Washington and Abraham Lincoln, I don’t discriminate. I would like the finished cabinet to be somewhere around 66 inches tall, 22 inches wide, and 11 inches deep. That should give me enough room for five shelves, with each shelf holding up to two standard sized documents, and/or a nick-knack or two. As far as material, I will likely use clear pine just for the expense (or lack of expense). However, I am going to Hearne Hardwoods next week for the Lie Nielsen hand-tool event, and if I can somehow afford it, I would love to pick up some quarter-sawn oak or possibly some walnut for this project, but considering that my budget is around $200 I don’t think that is going to happen. Still, I am going to attempt to make an accurate cut list and see what material may fall within my budget. If I get my drawings finalized, and If everything goes according to plan, I should get this project up and running by the first weekend in October. So even if my wife hates me, and a bunch of woodworking geeks hate me, and I’m working myself to death. I don’t care anymore, because I’m going to be woodworking again, and that’s going to make it all better. Last night after work I did something I haven’t done after work in some time; I woodworked. The cooler late-summer evening weather has finally allowed me to actually spend a little time in the garage in relative comfort. When I arrived home last night I hadn’t planned on woodworking in the least. But something told me that I should really get that leg vise re-attached before something bad happened to it. Maybe that something was past history, maybe it was the fact that when I entered my garage I noticed that the leg vise had been moved, and the person who had moved it wasn’t me. Either way, I decided not to delay, as the only thing I had left to do was attach the parallel guide. Last night I drilled out the holes for the parallel guide using a drill press, planed it with a smooth plane, added some chamfers, and sanded it down. I then used the finished guide to lay out the mortise on the chop, as after the dimensioning it was a slightly different size than it was when I first laid out the joint. For the guide I used a scrap piece of oak, and because it was slightly thinner than 3/4 , I could not use a ¾ chisel to chop out the mortise. That minor inconvenience notwithstanding, I had it done pretty quickly. 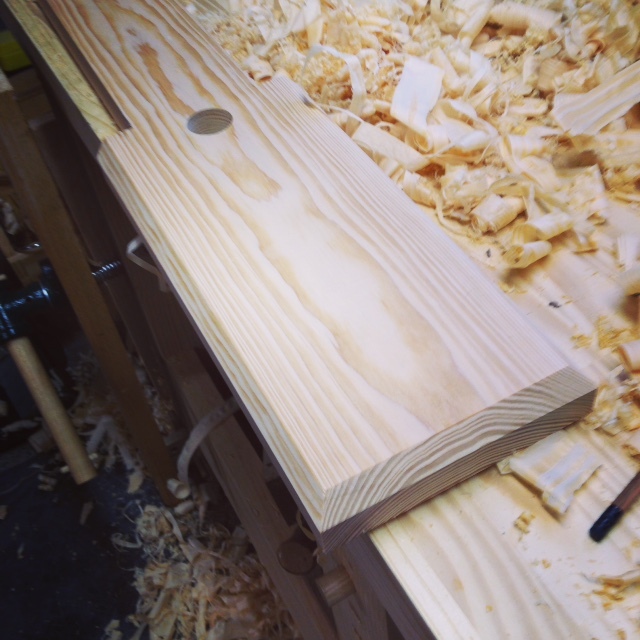 I made the tenon 1-inch long for added strength, and I thankfully achieved a near perfect fit. I even impressed myself with the fact that the bottom of the mortise was almost perfectly flat before I stretched the router plane to its limits to finish the job. Clamping a parallel guide to a chop for glue-up is not necessarily easy, and I probably could have inserted the dowel used for the stop and used the leg of the workbench as a clamp, or I could have trusted the “snugness” of the joint to hold. Instead, I pre-drilled for a couple of pocket screws to use as clamps, and I like the idea of having a mechanical fastener at this critical joint. After, I added a coat of wax, buffed it off, added another, and attached the vise to the bench. And I can honestly say that it looks great. Attached and ready to go. I had planned on letting everything dry overnight, by my impatience got the best of me, and somewhere around the witching hour I decided to give the new vise a test run. My first impressions were very favorable. The first and most obvious feature is the much wider face. The new chop is almost 3 inches wider than the previous one, and that creates a far greater clamping power/surface. 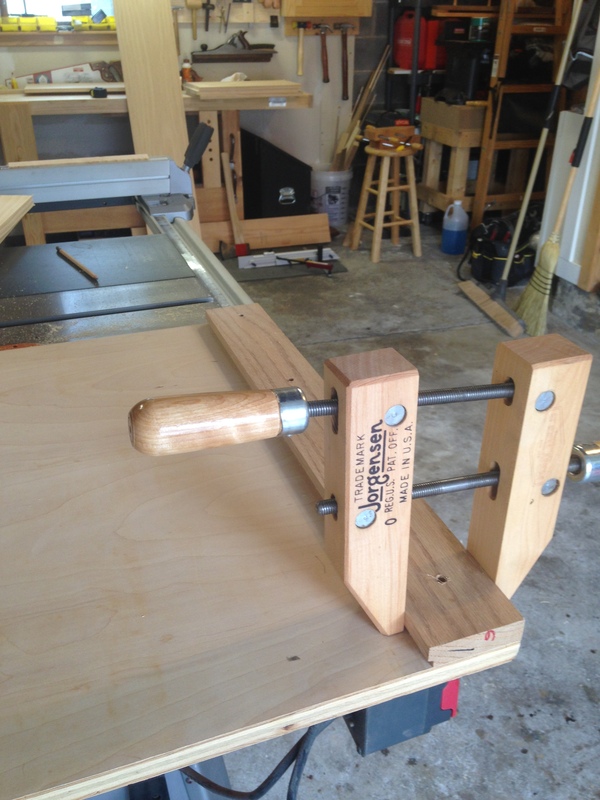 I clamped a board with very light pressure, barely applying any force to the vise handle, and the board would not budge an iota. In fact, it was so tight I could have used that clamped board to actually lift the bench (that is in theory-I only lifted it a hair as the bench is not light). I planed a few shavings just to give it a try and it worked perfectly. Another obvious feature is the fact that the new chop sits just 1/16th of an inch lower than the top of the bench, rather than nearly an inch and a half like the old vise chop did. This will allow me to clamp narrower and/or thinner boards much more easily. A less obvious feature is the improved parallel guide. On my original vise, I used a board 20 inches long as the parallel guide, for the new guide I used a board only 14 inches in length. Firstly, I’ve never clamped a board more than 10 inches wide or 6 inches thick in the vise, and secondly, the shorter guide is lighter and was much easier to keep straight and square when I was attaching it. Part of the issue may have been the fact that when I originally made the vise five years ago, I was still very much a beginner woodworker. The mortise I chopped out for the parallel guide then was not nearly as crisp or perpendicular as the mortise for the new guide. 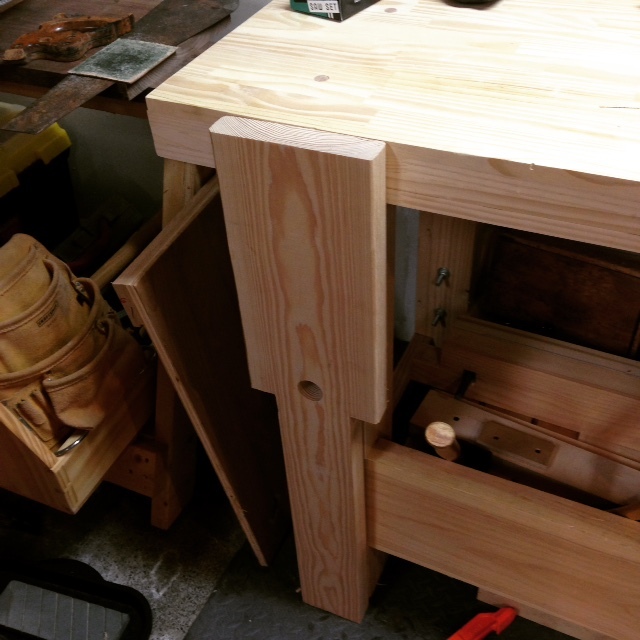 To put it bluntly, I am much better now, and that new guide is much improved in both construction and function, which is easily noticed just by the way it sits and much more so when the vise is in use. There is not a hint of crookedness, drag, or sag. It is much better than the original in every way. All in all this was a relatively fast and simple project, but those are usually my favorite. To me, there is nothing better than making something useful that also looks pretty good. For some reason or another I put off doing this for more than a year. 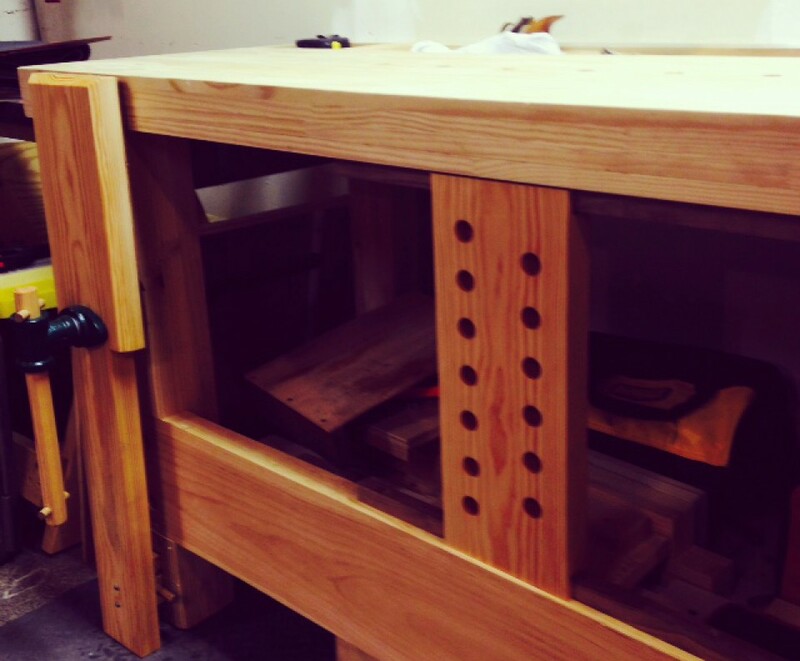 Now, I’m glad I took the time to do it, because I know it will improve my woodworking as well as improve the functionality of my bench. In any event, Phase 3 is finally complete and I actually have a few furniture projects planned for the upcoming months. 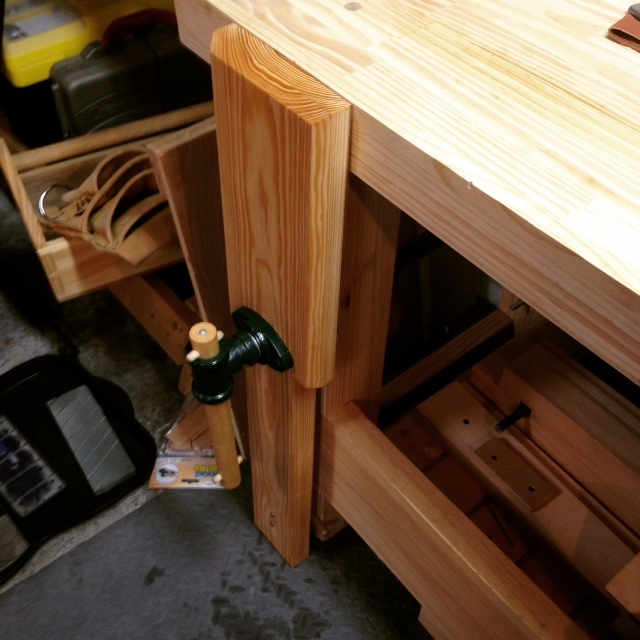 The only part of this project that bothered me is the fact that the new vise looks much nicer than the rest of the bench, and it has me considering…..
September 11, 2015 9:34 am / 2 Comments on Coming around again. This past summer has not been a good one for the Slightly Confused Woodworker. It started off with much promise, and the weeks leading up to Independence Day were great. But, inevitably things began to crumble, at first slowly, and then quickly. Sure enough, circumstances mostly out of my control, including work, health, and weather, started to take their toll and the summer soon slipped into a meaningless void of lost hopes and nostalgic longing. Last summer, maybe the worst of my existence, was lost in much the same way, the only difference being the weather was much nicer. I had the first health scare of my life (I wasn’t actually scared, more like pissed off), and as that summer faded into history I vowed to never lose a another again. Sometime, early in July, that vow was broken. It was not my finest hour. Though I didn’t plan on doing much woodworking this past summer, I did plan on thinking about it. I actually purchased for myself a nice sketch pad and artists pencils and supplies so I could draw some decent renditions of the furniture I would like to build. 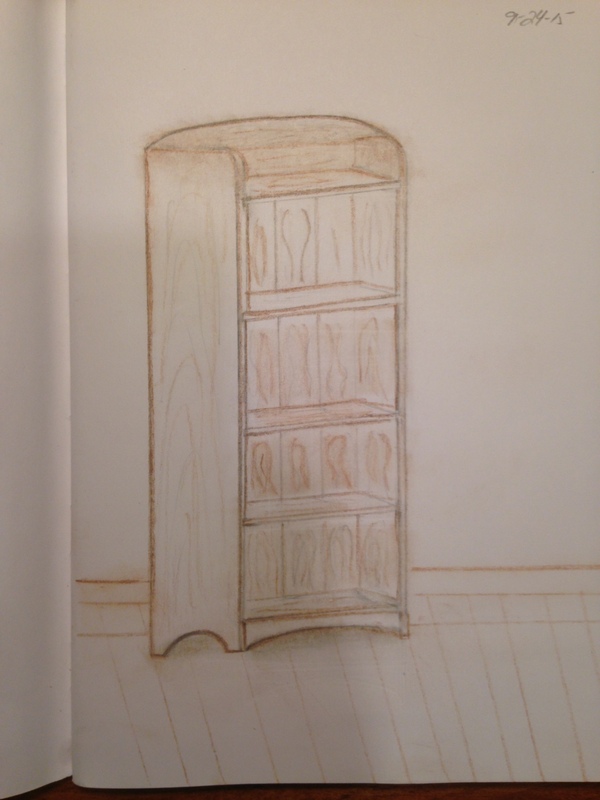 Among the things I drew were a wall clock and a bookcase, but that is where it stopped. I had hoped to have at least ten or so sketches of future projects in that pad, what I have is two. Still, there may be a little bit of hope peeking its annoying head over the horizon. September rolled in with the hottest weather of the season, and on Labor Day I wasn’t going to woodwork, but I woke even earlier than usual and decided to do what I enjoy doing for a change. 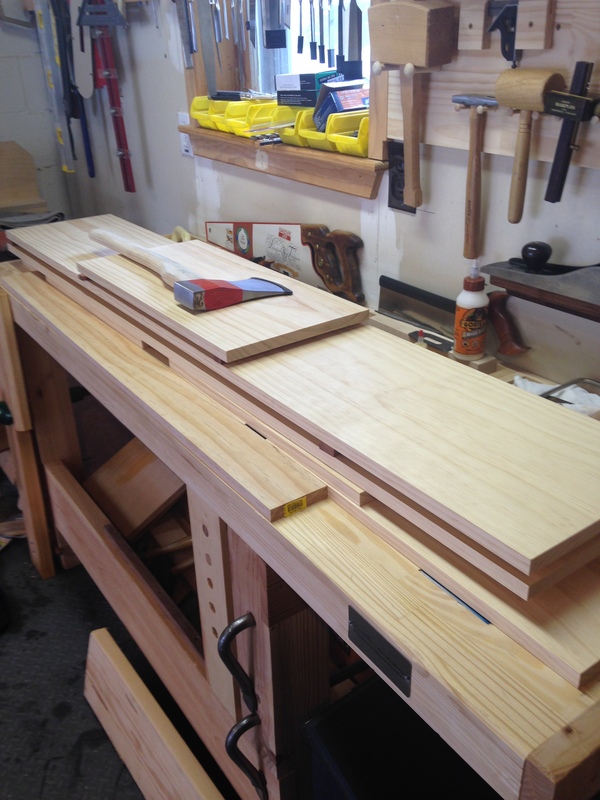 Back at the beginning of the summer I purchased a 2 x 10 piece of Douglass Fir to use as the new chop for my leg vise. Because it was still wet when I purchased it, I sawed it in half and stickered it in my garage, every few days alternating the two boards. Thankfully, both boards dried nearly flat, so I chose the one which looked best and went from there. To start, I removed the original leg vice from my bench and used it to mark the hole for the screw as well as the parallel guide. I drilled the hole with a 1 inch forstner bit, and then laid out the cut lines. I then used the table saw to cross cut the board to final length. For the shape of the chop, I’m sticking with the traditional “crutch” shape, with the top being wide, and the portion of the vice under the screw being the same width as the leg of the workbench. I’m not really doing this for any particular aesthetic reason, only to keep the weight of the chop down. 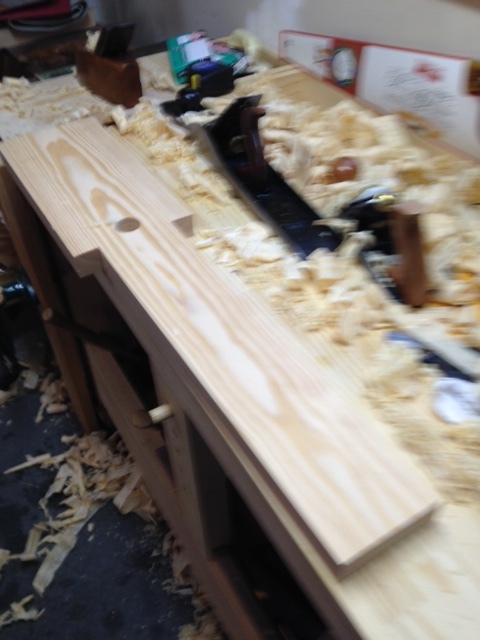 The top of the vise will now be flush with my bench top, which is the whole reason behind this change. So I once again used the table saw to rough out the shape, sawing as far as I could, then finishing the all of the cuts with hand saws and a chisel to clean it all up. I had thought about adding some decorative touches to the chop, but I will likely add just simple chamfers. Leg vises take a beating and there is no need to ornately decorate a piece of soft wood that will get punished every time it is in use. New leg vice still in rough form. 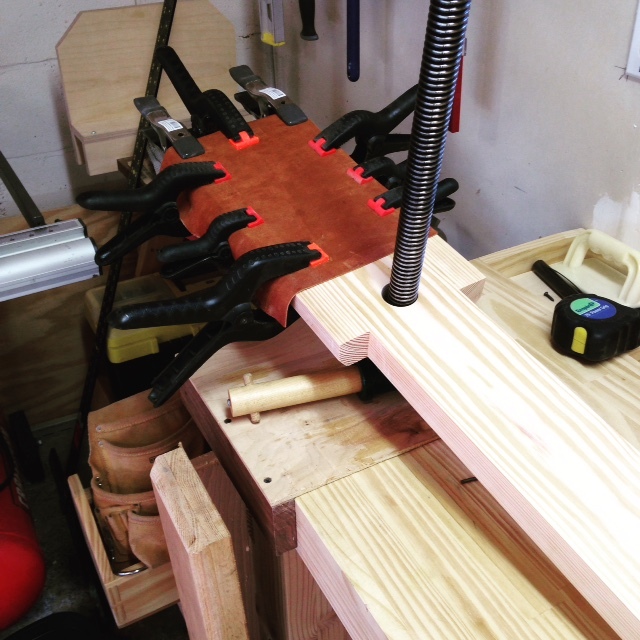 I only have to plane the chop smooth and make a new parallel guide and the vise will be ready to install (Ironically, I will need to re attach the very leg vise I’m replacing to do this). I will once again glue a piece of leather to the chop face to help with grip (it really does work). To finish the vise, I’m going to use a two coats of linseed oil and a coat of wax. With luck, and a few spare hours, it will be finished and installed this weekend, and while this little project may not mean much in the grander sense, it was pretty nice to go into my garage and woodwork for a few hours unhindered nonetheless.